"Vermont Vital Records, 1760-1954," database with images, FamilySearch (https://familysearch.org/ark:/61903/1:1:V8MV-KCZ : accessed 1 May 2016), Welcome Bemis Eastman, 19 May 1950, Death; State Capitol Building, Montpelier; FHL microfilm 1,984,923. Harrison Colby, A genealogy of the descendants of Abraham Colby and Elizabeth Blaisdell, his wife, who settled in Bow in 1768, , at https://archive.org/details/genealogyofdesce00colb . Concord, N.H.: Printed by the Republican Press Association, (1895) Microfilm #896944 of the Family History Library, Salt Lake City, Utah, p. 98. Guy S. Rix, History and Genealogy of the Eastman Family in America, , at https://archive.org/stream/historyandgenea00rixgoog . Concord, N.H.: (1901) , p. 509. Harrison Colby, A genealogy of the descendants of Abraham Colby and Elizabeth Blaisdell, his wife, who settled in Bow in 1768, , at https://archive.org/details/genealogyofdesce00colb . Concord, N.H.: Printed by the Republican Press Association, (1895) Microfilm #896944 of the Family History Library, Salt Lake City, Utah, p. 86. 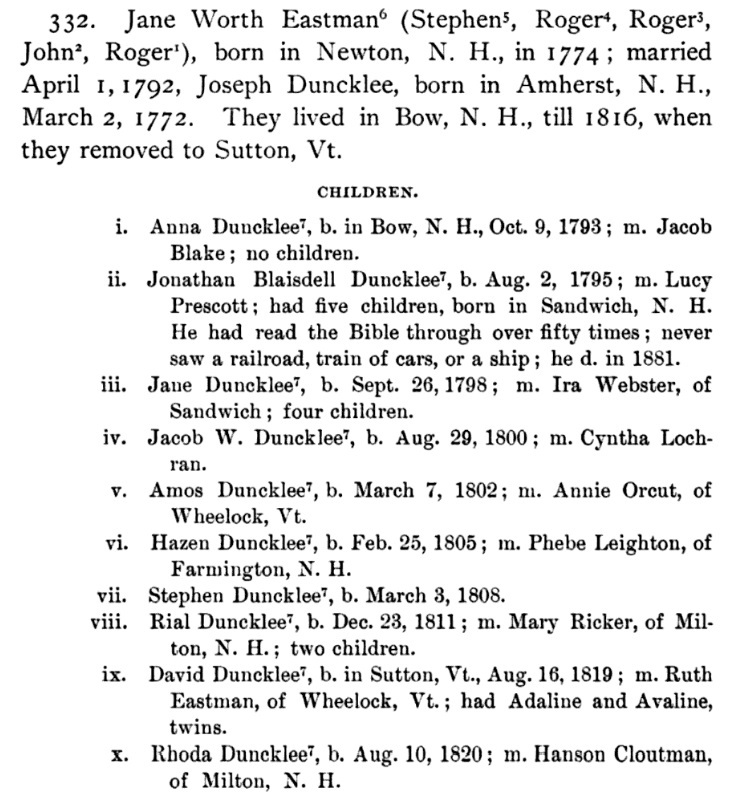 "New Hampshire Marriage Records, 1637-1947," database with images, FamilySearch (https://familysearch.org/ark:/61903/1:1:FLFJ-7H9 : 12 December 2014), Eli Eastman and Ruth Clement, 15 Mar 1809; citing Bow, , New Hampshire, Bureau of Vital Records and Health Statistics, Concord; FHL microfilm 1,000,988. "Vermont Vital Records, 1760-1954," database with images, FamilySearch (https://familysearch.org/ark:/61903/1:1:XFVW-NQR : 6 December 2014), John Eastman, 18 Jun 1810, Birth; State Capitol Building, Montpelier; FHL microfilm 27,538. 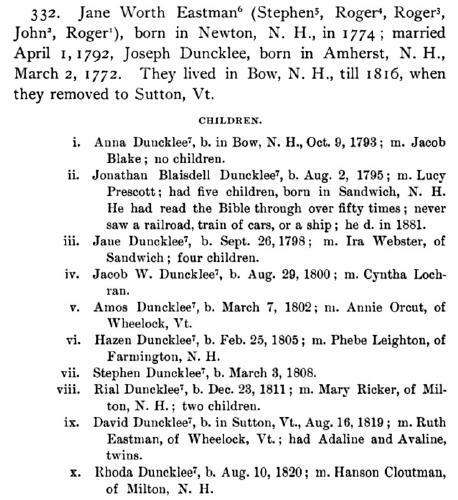 "Vermont Vital Records, 1760-1954," database with images, FamilySearch (https://familysearch.org/ark:/61903/1:1:XFVW-NYN : 6 December 2014), Mahala Eastman, 30 Sep 1812, Birth; State Capitol Building, Montpelier; FHL microfilm 27,538. "Vermont Vital Records, 1760-1954," database with images, FamilySearch (https://familysearch.org/ark:/61903/1:1:XFVW-X3G : 6 December 2014), Beri Eastman, 14 Sep 1814, Birth; State Capitol Building, Montpelier; FHL microfilm 27,538. "Vermont Vital Records, 1760-1954," database with images, FamilySearch (https://familysearch.org/ark:/61903/1:1:XFVW-JYC : 6 December 2014), Ruth Eastman, 08 Mar 1817, Birth; State Capitol Building, Montpelier; FHL microfilm 27,538. COLBY FAMILY & OTHERS at http://freepages.genealogy.rootsweb.com/~colby/colbyfam, /d253.html. COLBY FAMILY & OTHERS at http://freepages.genealogy.rootsweb.com/~colby/colbyfam, /d254.html. 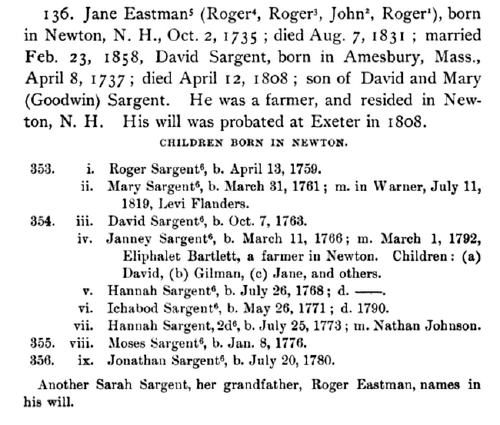 "New Hampshire Birth Records, Early to 1900," database with images, FamilySearch (https://familysearch.org/ark:/61903/1:1:FLLP-KZV : 12 December 2014), Jacob Eastman, 31 Jul 1745; citing Kingston, Rockingham, New Hampshire, United States, Bureau of Vital Records and Health Statistics, Concord; FHL microfilm 1,000,500. Guy S. Rix, History and Genealogy of the Eastman Family in America, , at https://archive.org/stream/historyandgenea00rixgoog . Concord, N.H.: (1901) , p. 132. Vital records of Amesbury, Massachusetts to the end of the year 1849, , at https://archive.org/details/vitalrecordsofam00ames . Topsfield, Mass. : Topsfield Historical Society, (1913) , p. 91. 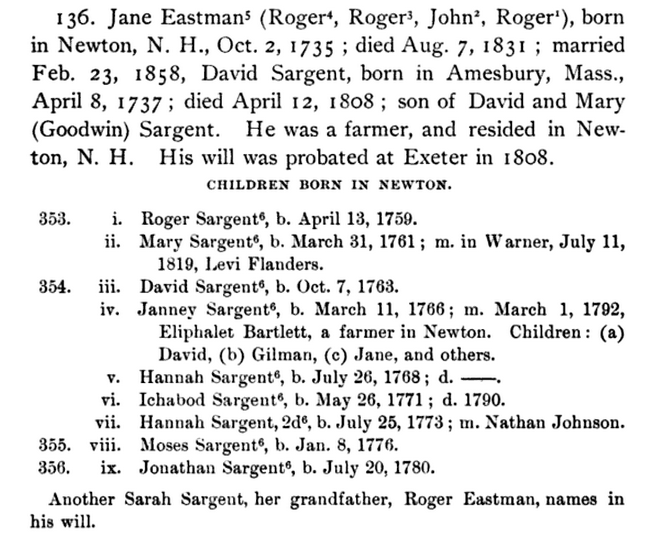 Edwin Everett Sargent, Sargent record : William Sargent of Ipswich, Newbury, Hampton, Salisbury and Amesbury, New England, U.S. : with his descendants and their intermarriages, and other Sargent branches, St. Johnsbury, Vt.: Caledonian Co., (1899) , p. 41. Harrison Colby, A genealogy of the descendants of Abraham Colby and Elizabeth Blaisdell, his wife, who settled in Bow in 1768, , at https://archive.org/details/genealogyofdesce00colb . Concord, N.H.: Printed by the Republican Press Association, (1895) Microfilm #896944 of the Family History Library, Salt Lake City, Utah, p. 86, 95. Harrison Colby, A genealogy of the descendants of Abraham Colby and Elizabeth Blaisdell, his wife, who settled in Bow in 1768, , at https://archive.org/details/genealogyofdesce00colb . Concord, N.H.: Printed by the Republican Press Association, (1895) Microfilm #896944 of the Family History Library, Salt Lake City, Utah, p. 95. Harrison Colby, A genealogy of the descendants of Abraham Colby and Elizabeth Blaisdell, his wife, who settled in Bow in 1768, , at https://archive.org/details/genealogyofdesce00colb . Concord, N.H.: Printed by the Republican Press Association, (1895) Microfilm #896944 of the Family History Library, Salt Lake City, Utah, p. 96. Guy S. Rix, History and Genealogy of the Eastman Family in America, , at https://books.google.com/books?id=mNwRhOz28XgC . Concord, N.H.: (1901) , p. 244. Vermont. Secretary of State, General index to vital records of Vermont, early to 1870, Salt Lake City: Filmed by the Genealogical Society of Utah, (1951) , Batch number: 7450084, Source Call No. 0027538. "Vermont Vital Records, 1760-1954," database with images, FamilySearch (https://familysearch.org/ark:/61903/1:1:XFVW-NYR : 6 December 2014), Mahalah Eastman, 18 Mar 1855, Death; State Capitol Building, Montpelier; FHL microfilm 27,538. Church of Jesus Christ of Latter-day Saints. Salt Lake Temple, IGI reference to Endowments for the dead, 1893-1970; heir indexes, 1924-1956; baptisms for the dead, 1941-1970, Salt Lake City: Filmed by the Genealogical Society of Utah, (1959-1979) , Film Number: 184230, Page Number: 933, Reference Number: 20831. Church of Jesus Christ of Latter-day Saints. Logan Temple, IGI reference to Endowments for the dead, 1884-1970; heir indexes, 1884-1961; baptisms for the dead, 1943-1970, Salt Lake City: Filmed by the Genealogical Society of Utah, (1958-1971) , Film Number: 178001, Page Number: 637, Reference Number: 20594. COLBY FAMILY & OTHERS at http://freepages.genealogy.rootsweb.com/~colby/colbyfam, /d255.html. living at Prescott P.O., Clifton, Pierce County, Wisconsin. 1880 United States. Census Office. 10th census, 1880 federal population census, Washington, District of Columbia: National Archives and Records Service, ([19--]) , FHL Film 1255441; National Archives Film T9-1441; Page 148B.